The MacBook comes with Apple's controversial Touch Bar -- and while we haven't really found much use for it yet, some people may end up loving it. Hidden beneath one of the MateBook's keys is the webcam. This is great for those who are worried about privacy, but also makes for an even worse camera angle than laptops like the new Dell XPS -- imagine Skyping with someone and seeing more fingers than face. Its Windows, is it not. Therefore no comparison. I'd be less concerned that it runs Windows instead of OS X and more worried that it's a Huawei. It bares mentioning that the Matebook X can come with the MX150, which should be closer to ~45K on GB compute. Iris Plus beats the HD Graphics, MX150 beats both by a big margin. OS X vs Windows … I’d happily get beaten on a few minor hardware specs if it helps me avoid having to use Windows. I know recent MacBooks have not been flawless, but no pc laptop has come close enough to make me consider switching. But kudos to Huawei for creating this apparently pretty decent machine. I'm very pleased to hear that at least one of the USB-C ports offers TB3, that's a big plus for anyone hoping to use Pro apps on a MateBook, but that incredibly stupid placement of the webcam is a huge negative, not to mention that it is likely a Chinese spyware machine by design, coming from Huawei. Even putting aside the OS choices for the moment (and remembering that the Mac is the only platform that can natively run macOS, Windows, and Linux), the difference in price is trivial for all the extra features and better design/engineering/quality of software you get with the MBP. The Apple MBP vs the Huawei MBP. Can't get anymore shameless than that! 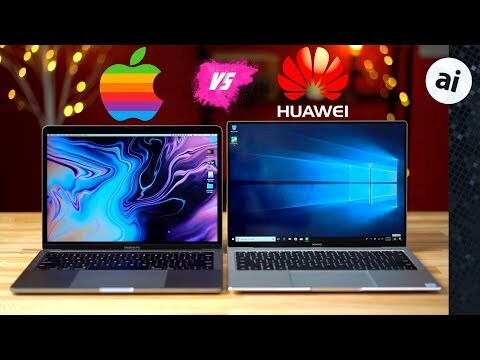 If Huawei could create an OS other than Windows and sell computers, they would rip off macOS wholesale. Utterly disappointingly both are almost impossible to upgrade! The MateBook has an m.2 SSD that can be replaced, but otherwise both have integrated non-upgradable RAM, which is what we've been putting up with from Apple since 2012! Integrated non-upgradable SSDs since 2016. It's getting increasingly difficult to find any premium laptop (good build quality and higher than 1080p resolution) with upgradable RAM these days. Let me know if you find any! Would regular SO-DIMM slots hurt that much? They seem to have been all sacrificed for an extra 1-2 mm thickness reduction or so. Improved upgradability would save consumers a lot of money as well as reduce e-waste considerably! I just realized something...Notice anything weird here? Yeah, no direct cooling of heat fins, the copper part above the fan is just the wifi antenna. Weird. Surely they're not trying to cool the MX150 model like this?